Actress Darryl Hannah and NASA scientist James Hansen are just two of the more than 800 environmental protesters that have been arrested in front of the White House this week. The crowd has been demonstrating against the proposed Keystone Pipeline XL project, which involves building a 1,700-mile (2,735-kilometer) heavy-oil pipeline from the tar sands of Alberta, Canada, to oil refinement facilities along the Gulf Coast of the United States. The decision to allow TransCanada Corp. to go through with the $7 billion Keystone XL pipeline rests with the U.S. government, and the protesters are hoping to sway President Obama to veto the permit. Aside from the environmental disruption caused by constructing the underground pipeline, the environmentalists’ opposition to Keystone hinges on the hydrocarbon chemistry of tar sands and how they’re converted into crude oil. Tar sands, also known as oil sands, are a mixture of roughly 90 percent sand, clay and water and 10 percent bitumen, a thick hydrocarbon liquid. After extracting that 10 percent of bitumen from the tar-sand mixture, the bitumen can be purified and refined into synthetic crude oil. 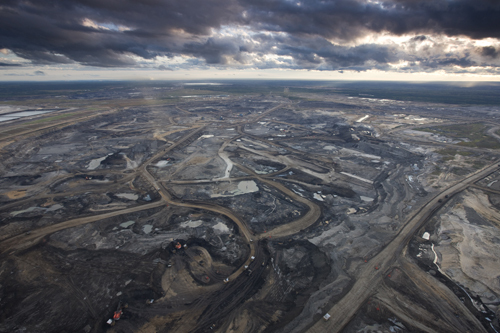 In North America, tar sands are concentrated in the Athabasca Oil Sands in Alberta, Canada. Because of Canada’s vast oil deposits, it's the top supplier of crude oil to the United States. Saudi Arabia is the second-largest supplier. Tar sands are also found in Venezuela and the Middle East. The proposed Keystone XL pipeline would run from the Alberta tar sands down the middle of the United States through Montana, North Dakota, South Dakota, Nebraska and Oklahoma, all the way to Texas, where it will be refined and converted into gasoline. That's longer than the Trans Alaska Pipeline, which stretches 800 miles. Currently, there are around 55,000 miles of oil pipeline crisscrossing the United States. Squeezing oil out of tar sand is an extremely wasteful process: it takes between 2 and 4 tons of tar sand and two to four barrels of water to produce a single barrel of oil. Rather than drilling for oil, enormous shovels carve out open pits in the tar sands, scooping out the greasy interior to be hauled to a processing facility. There, the tar sand is combined with water to form a slurry, which forces the sand to sink to the bottom of the mixture while the bitumen floats to the top. Once the bitumen is extracted, the run-off is piped into large, stagnant tailing ponds of sand, water, and bitumen impurities. To make it to the pump, refined bitumen heads to an oil refinery where it’s converted into gasoline. And since bitumen is a highly viscous “heavy” oil that doesn’t flow as easily as lighter crude, it requires more processing to facilitate its flow through the oil pipelines. Overall, mining tar sands, extracting bitumen and converting it to gasoline releases three times more carbon dioxide than typical oil production. In addition to massive amounts of tar sand needed to extract oil and the carbon emissions generated, the tar sand mining operation takes places in Alberta's boreal forest, a relatively untouched ecosystem prized for its biodiversity. But the habitat destruction has threatened the livelihood of various native species, and the Alberta Water Research Institute is currently spending $15 million to prevent runoff toxins collected in tailing pools from entering nearby water supplies. As the price of crude oil has risen and relations with the oil-rich Middle East have deteriorated, tar sands close to American borders have become a more attractive option in the past decade. Those in favor of the Keystone XL pipeline argue that importing tar sands oil from Canada, a political ally, will move the country toward more energy independence. However, those opposing the pipeline counter that reducing reliance on fossil fuels like tar sands oil is the only long-term path toward energy independence. Tar sands around the world also collectively represent 3 trillion barrels of oil. But a majority of that tar sand bitumen lies too deep in the earth for recovery with today’s mining technology. Nevertheless, Canadian tar sands produce more than 1 million barrels of crude synthetic oil every day. If completed, the Keystone XL pipeline would allow up to 830,000 barrels of crude oil to flow daily to the Gulf Coast. In June 2011, the U.S. imported just over 2 million barrels of crude oil from Canada every day, followed by 1.1 million barrels from Saudi Arabia and Mexico each. 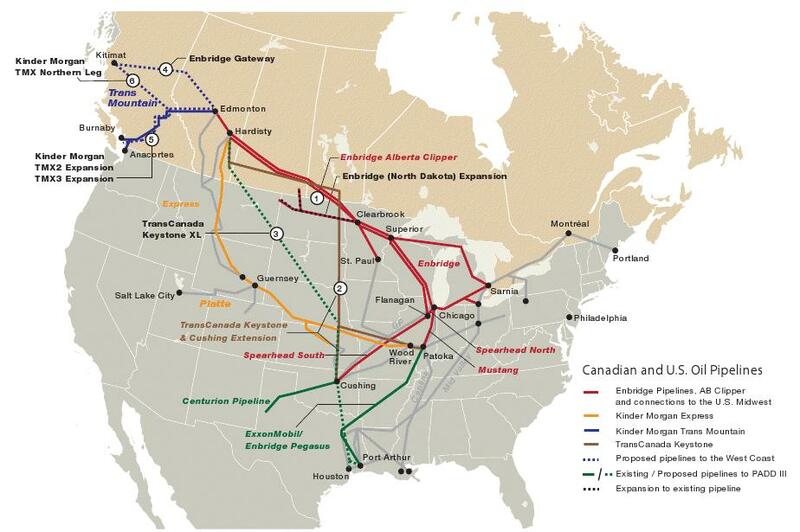 The U.S. government should reach a decision on the Keystone XL by the end of the year. The U.S. State Department has already issued a report on the pipeline’s potential environmental effects and found “no significant impact on most resources along the proposed pipeline corridor.” Yet, the report did raise concern about the potential of pipeline leaks in "environmentally sensitive areas," such as the Ogallala Aquifer, a primary freshwater source for the Plains regions. The 3,456 kilometres (2,147 mi) long pipeline will transport crude oil from Hardisty, Alberta to the United States refineries in Wood River, Illinois and Patoka, Illinois.The Canadian section involves approximately 864 kilometres (537 mi) of pipeline converted from the Canadian Mainline natural gas pipeline and 373 kilometres (232 mi) of new pipeline, pump stations and terminal facilities at Hardisty, Alberta. The United States section is 2,219 kilometres (1,379 mi) long. It runs through Buchanan, Clinton and Caldwell counties in Missouri, and Nemaha, Brown and Doniphan counties in Kansas.In Jefferson County, Nebraska, a 291 miles (468 km) long extension would take the pipeline to the oil hub in Cushing, Oklahoma. The 3,190 kilometres (1,980 mi) long Keystone XL starts from the same area in Alberta as the main pipeline.The Canadian section will consist of 529 kilometres (329 mi) of new pipeline. It joins the main Keystone Pipeline at Steele City, Nebraska. From there it runs parallel to the Cushing extensions.From Cushing, it would be expanded to Port Arthur, Texas, and Houston, Texas. The pipeline will reach to Illinois in late 2009, to Oklahoma in late 2010, and to Texas in 2012.TransCanada says the pipeline will later be expanded to reach refineries in the USA Gulf Coast. The initial capacity of Keystone Pipeline is 435,000 barrels per day (69,200 m3/d) which will be increased up to 590,000 barrels per day (94,000 m3/d).The diameter of the pipeline is 36 inches (910 mm).It will have a minimum ground cover of 4 feet (1.2 m). The Keystone XL will add 510,000 barrels per day (81,000 m3/d) increasing the total capacity up to 1.1 million barrels per day (170×103 m3/d). The original Keystone Pipeline cost $US5.2 billion with the Keystone XL expansion slated to cost approximately US$7 billion. 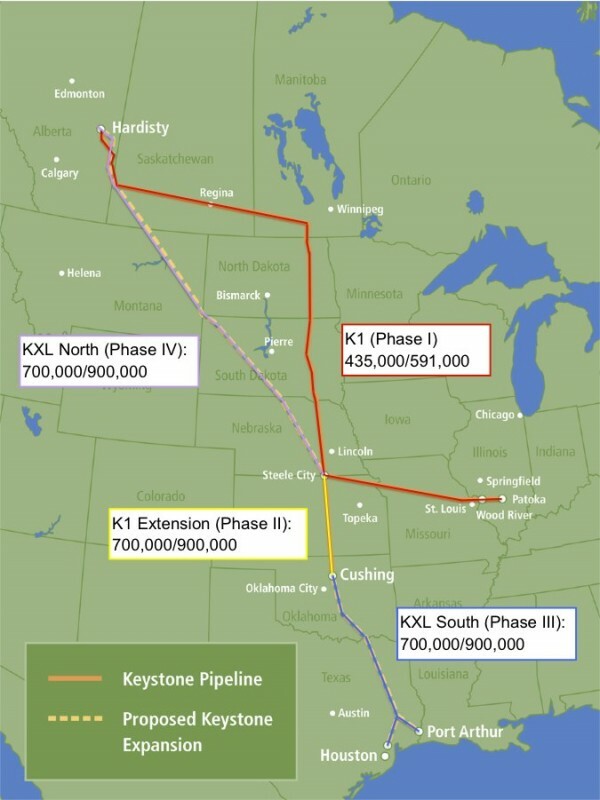 The Keystone XL is expected to be completed by 2012–2013.